The font appears in qrexplore.com website. Looks similar to SB-Standard/Depixel Bold except for few minor variations(D, I, 3 chars). To me this font looks like the dreaded Comic Sans . It appears on the cover of a Laserdisc - produced in 1988/89 and manufactured and released in 1990. This font looks similar to stencil and I used it long time ago. Can you please identify it? Font appears in Jerk Pit Cafe Logo. Looks like a mix between a sans-serif and display font. 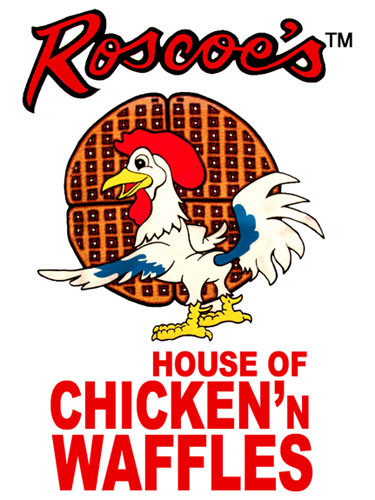 This font appears in logo for Roscoe's waffel and chicken. It looks very similar to Helvetica Cond Bold. Appears to be Arial Black, artificially condensed. Arial Condensed Extrabold is similar, but not a match (the counter of the "C" is too squared off, and the counter of the "A" is larger/more open, etc. ).